Two days after an episode of interethnic violence in July 2009, a group of Uighur demonstrators in Urumqi, mostly women, confronts the police, demanding information about the disappearance of their husbands, brothers, and sons. 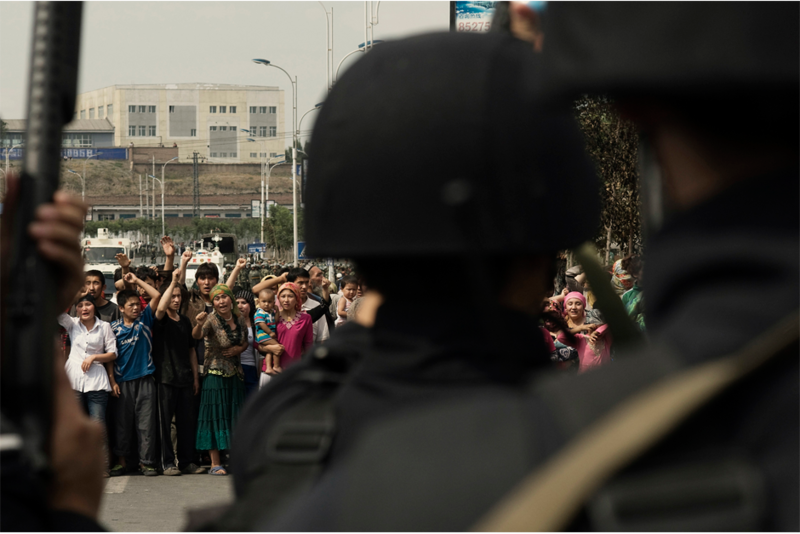 According to Human Rights Watch, in the days following the riots, dozens of Uighur men and teenagers were detained by police and have not been heard of since. Uighurs walk beneath a video surveillance camera, which monitors street activity at a weekly marketplace in the city of Kuqa on September 12, 2008. 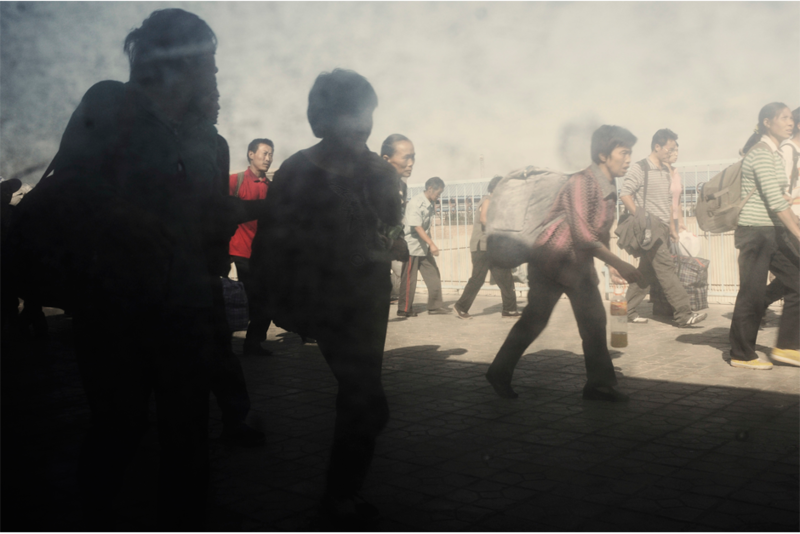 Han migrants exit a train in Aksu, a city of less than a million, on September 13, 2008. Xinjiang has seen an influx of Han Chinese, encouraged to migrate by Beijing’s “Go West” campaign. Many Uighurs complain that they are victims of ethnic discrimination and that the region’s rapid economic growth has not benefited them. 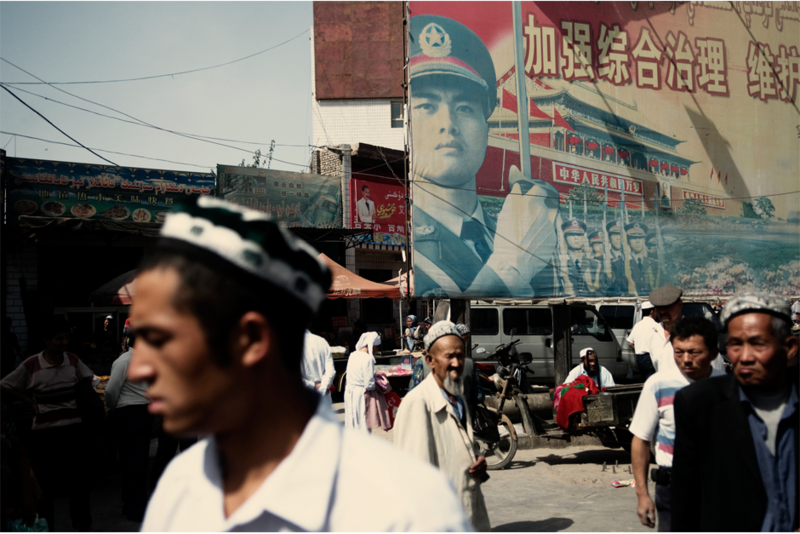 Uighurs pass by a propaganda poster featuring the People's Liberation Army in Kuqa, some 2,200 miles west of Beijing, in 2008. 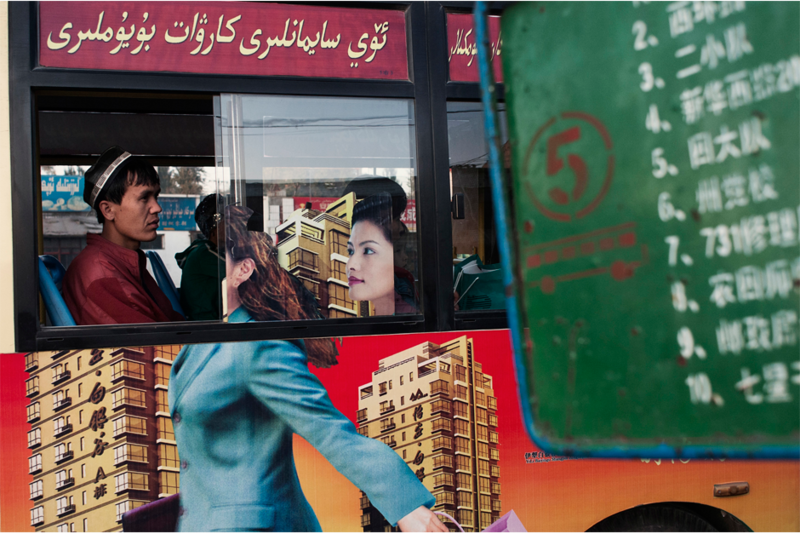 In the county seat of Yiling, a Uighur passenger rides a bus carrying an advertisement for a real estate project featuring a Han businesswoman. At a Kuqa weekly market, shawls, pants, and other cloths hang on sale in one of the many stalls. 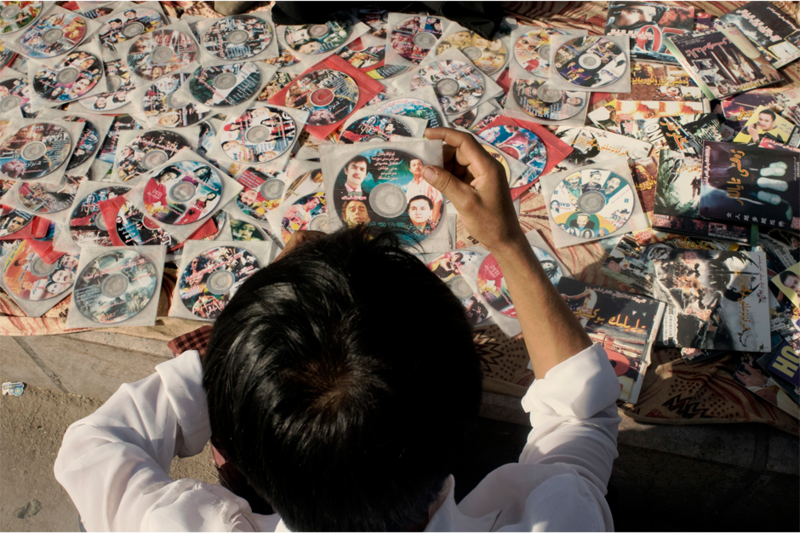 A Uighur browses CDs and DVDs in Kuqa. Uighurs tend to prefer music and movies in their local dialect or from Turkey and India rather than entertainment in Mandarin Chinese. 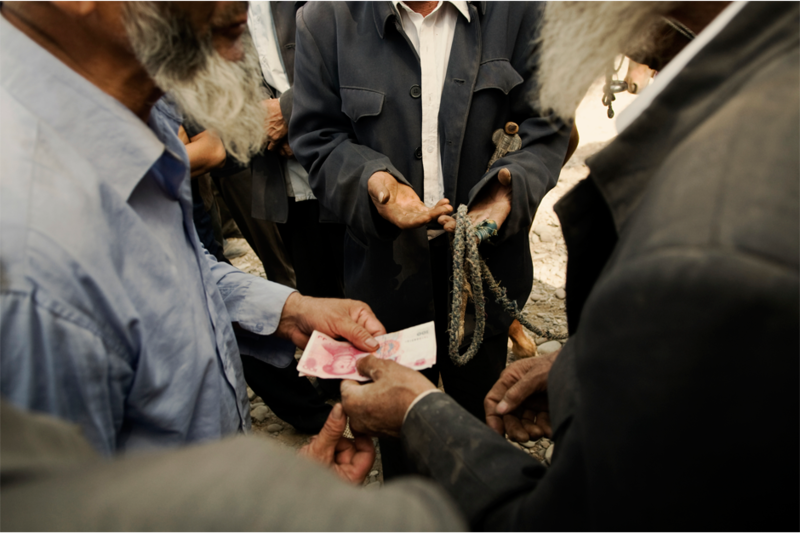 Uighurs exchange money for the sale of a cow at the Sunday livestock market in Kashgar. Beijing is investing heavily in efforts to make Kashgar a center of Central Asian trade. Many locals complain this plan fails to benefit Uighur locals. 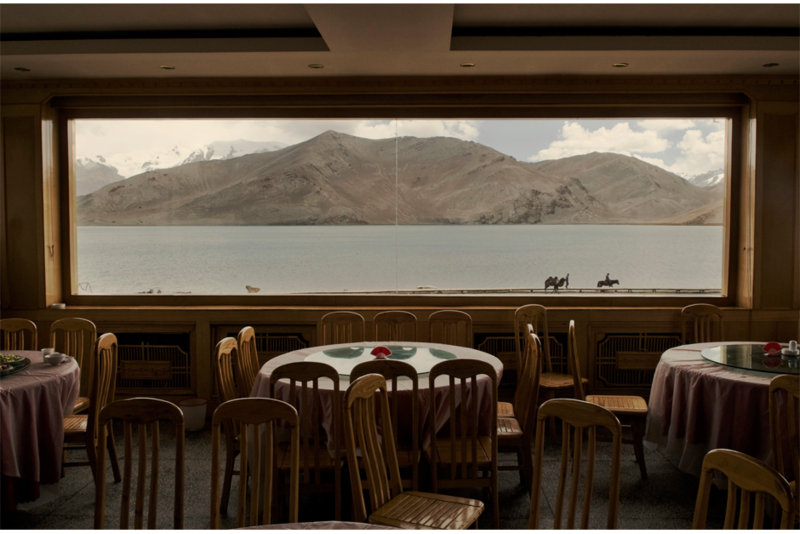 An empty restaurant with a view of Karakol Lake in 2008. Xinjiang’s tourism industry took a major hit the following year in the aftermath of the Urumqi riots. Many Han Chinese are fearful of visiting the region despite its reputation, beautiful landscape, and distinctive culture. From January to April of this year, Xinjiang’s Tourism Bureau offered domestic tourists a travel incentive of $80 if they visited the region. 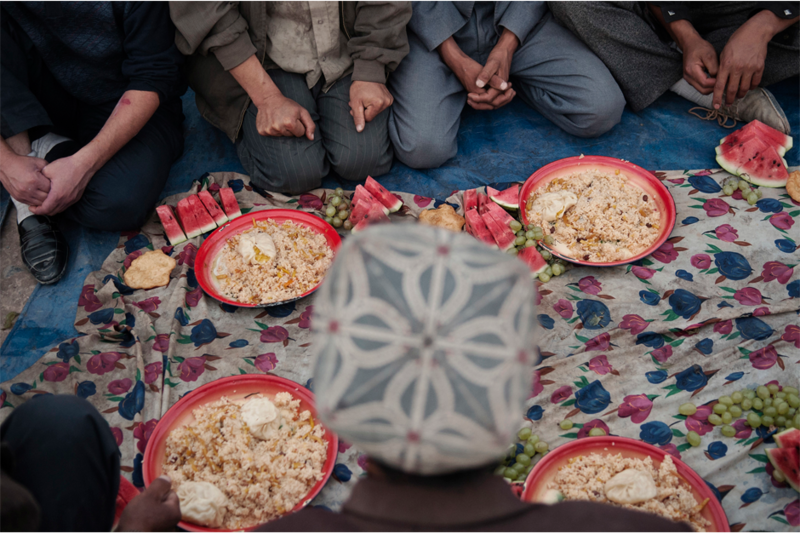 In Kashgar, Uighurs pause before breaking the fast during the holy month of Ramadan. Throughout the Muslim world, food is customarily distributed to the needy during this holy month. However, this past holiday many in the Uighur community complained of religious repression imposed from Beijing. Among the rules in effect: it is forbidden to pray in public, apart from inside religious buildings. In addition, civil servants and people younger than 18 are banned from visiting mosques and from fasting during Ramadan. 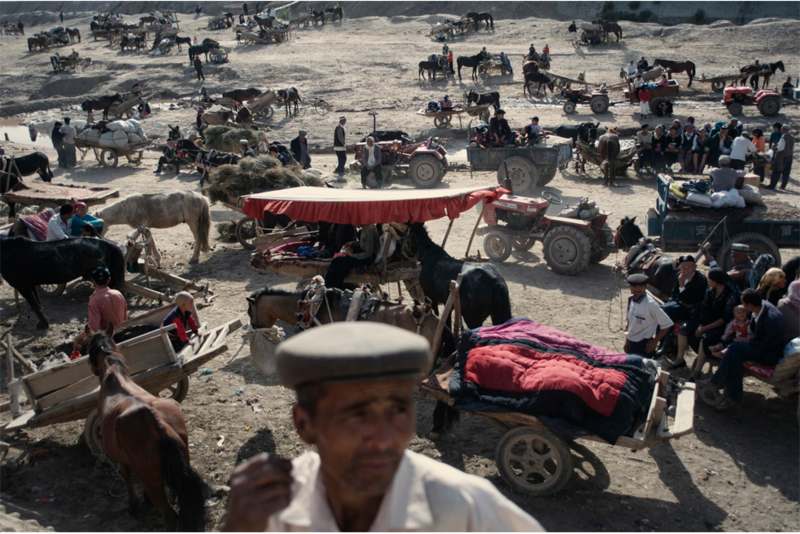 Donkeys and horses rest and tractors are parked on a dry riverbed at the weekly market in Kuqa. Southern Xinjiang is one of China’s poorest regions, where for many the main source of income is farming and animal husbandry. A resident of Kashgar’s old city heads to a local mosque for evening prayer in the summer of 2009. 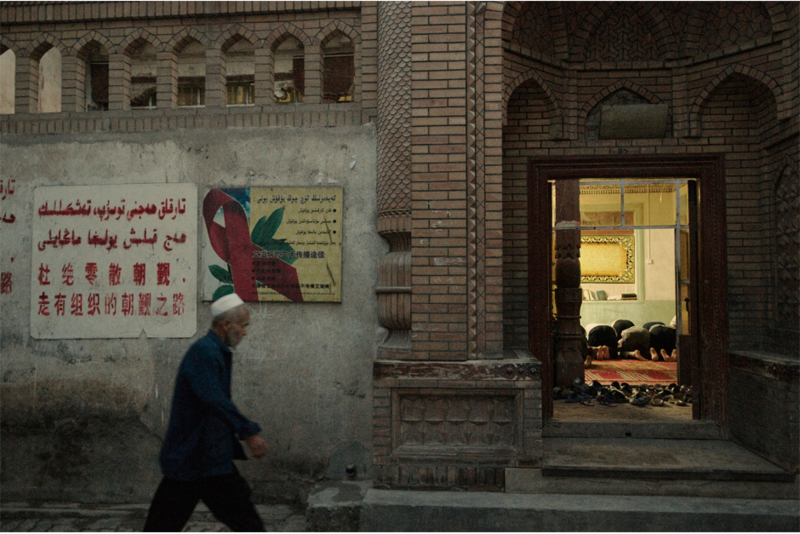 On the wall of the mosque next to a board promoting AIDS awareness is a legal reminder in both Uighur and Mandarin: “Individual pilgrimage is strictly prohibited. Take the path of organized pilgrimage.” The pilgrimage to Mecca, one of the pillars of Islam, is strictly controlled by the government. In general, it is much more difficult for Uighurs than for Han Chinese to obtain a passport and travel overseas. 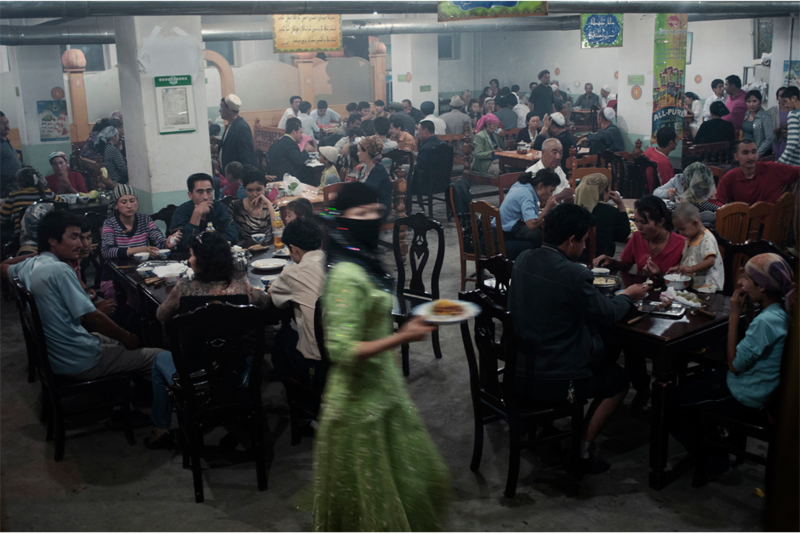 In Yarkand, a waitress carries food to Uighur families gathered to break the fast in a restaurant during the holy month of Ramadan, September 2008. The city was once the seat of an ancient Buddhist kingdom. In July 2014, Chinese police shot dead dozens of knife and axe-wielding Uighurs who went on a rampage, apparently angry over restrictions during the Islamic holy month of Ramadan. In what is seen as an act of defiance in today’s political climate, Uighurs pray near a shrine of Imam Asim who in the 11th Century, according to legend, successfully fought off the encroachment of Buddhist forces at the edge of the Taklamakan Desert near Hotan. 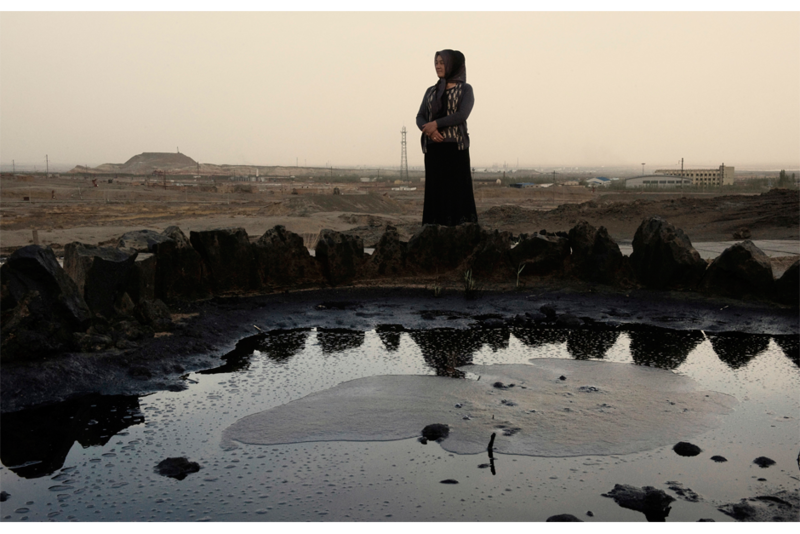 A Uighur woman stands by a pool of oil that has bubbled to the surface in April 2009, near Karamay, a center of energy exploitation in this region. Twenty percent of China’s oil production comes from Xinjiang, making it a strategic region for China. The oil and petrochemical sectors account for as much as 70% of Xinjiang’s local economy. Locals complain that energy sector profits go directly to Beijing and do not benefit the region. 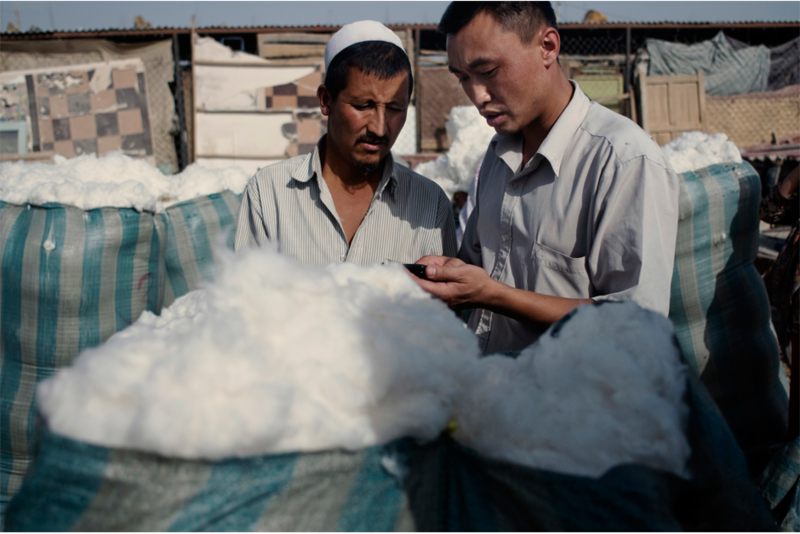 A Han businessman buys cotton from a Uighur at a market in Kashgar in 2008. 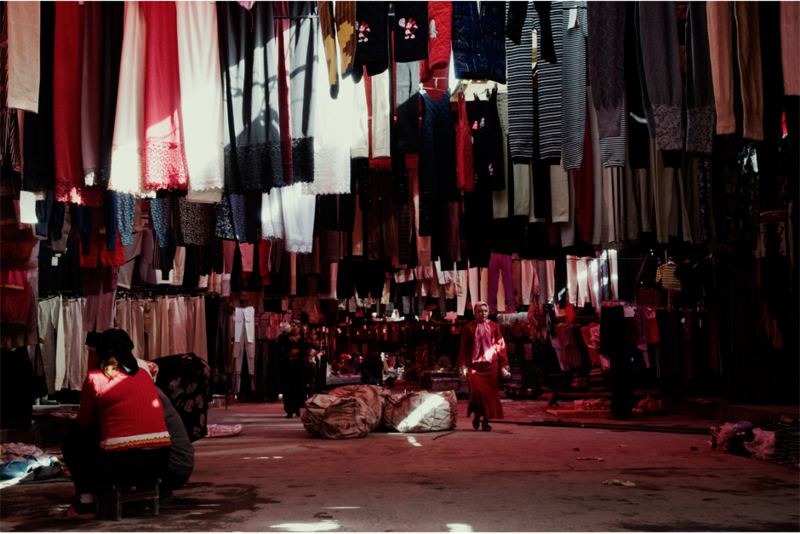 In the bazaars of the southern crescent of Xinjiang, Han Chinese are a rare sight. 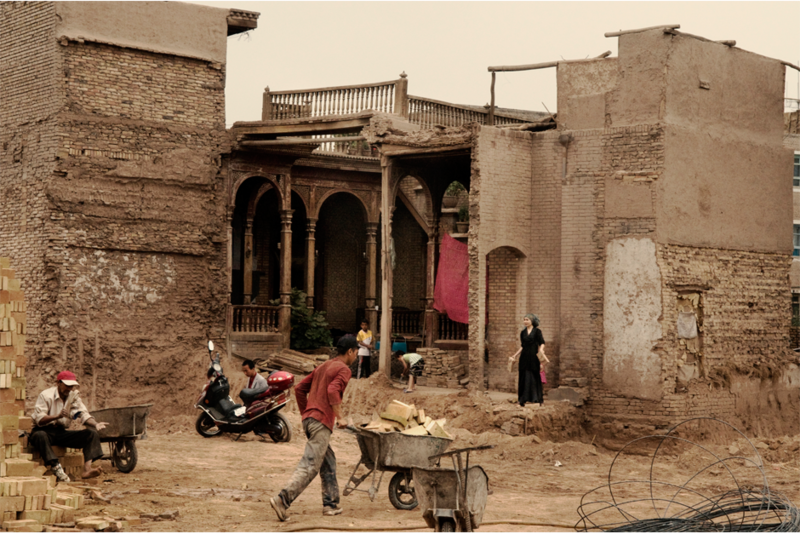 Next to a construction site in the old city of Kashgar, inhabitants of a traditional courtyard house stand by the wall of their house, demolished a few hours earlier, in June 2009. The residents were left to clean up the rubble. The city, one of the oldest on the Silk Road, has been demolished and rebuilt, with many of its inhabitants forced to move to the outskirts. 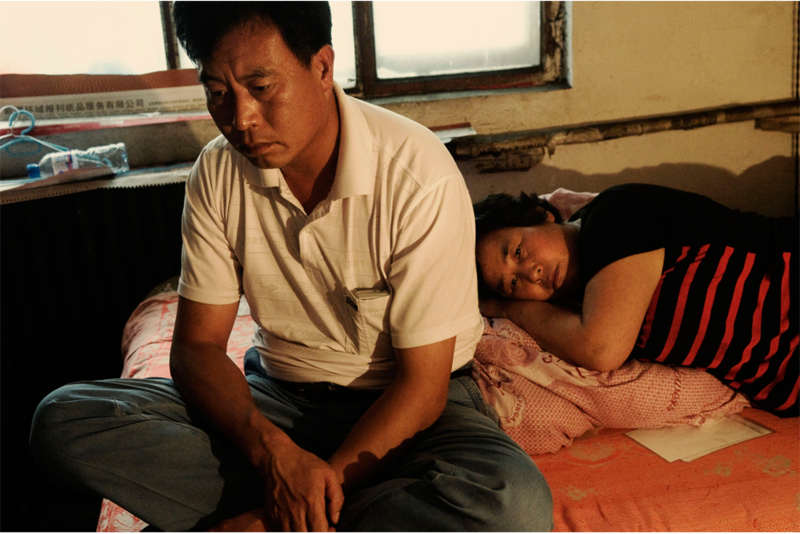 Lu Sifeng and his wife, Zhang Aiying, sit on their bed lost in thought after learning that their son, 25-year-old Lu Huakua, has died from injuries sustained during an attack by a Uighur mob, during the July 5, 2009 riots in Urumqi. The couple, originally from Henan, had moved to Xinjiang a couple of years earlier and found work selling fruit and vegetables. 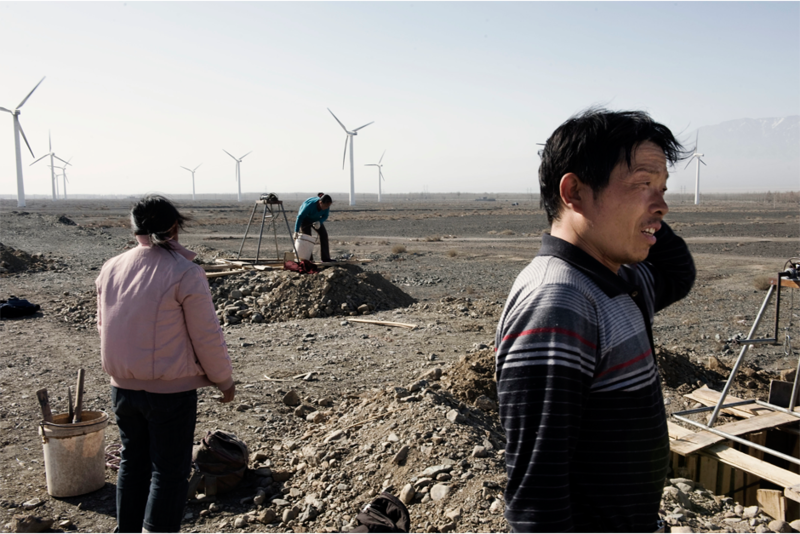 Migrant Han workers from Henan dig holes near a wind farm along National Highway 312 between Urumqi and Turpan, 2010. 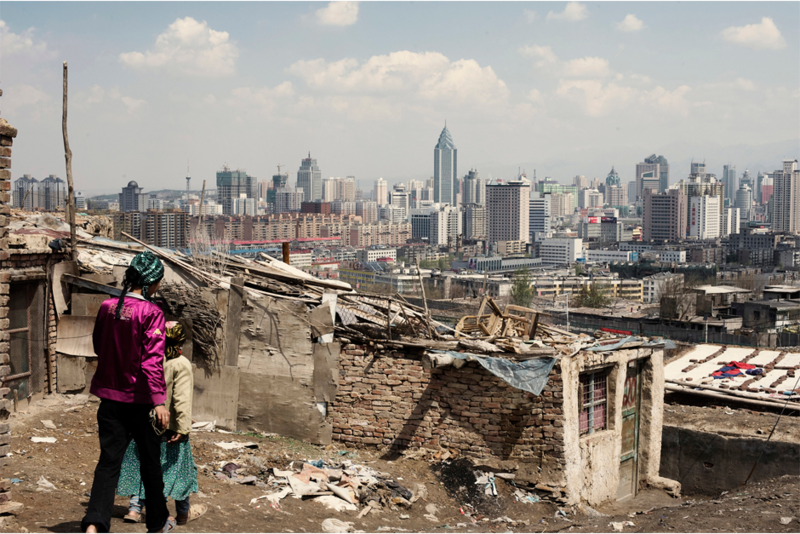 The slums of Urumqi stand a world away from the high-rises that make up the skyline of Xinjiang’s provincial capital. Many Uighurs who migrated to the urban center of Xinjiang live in these slums, and government officials pinned the July 2009 riots on members of this community. The slums have largely been demolished since this photo was taken in 2010, to make room for a high-speed train linking Urumqi to the rest of China. 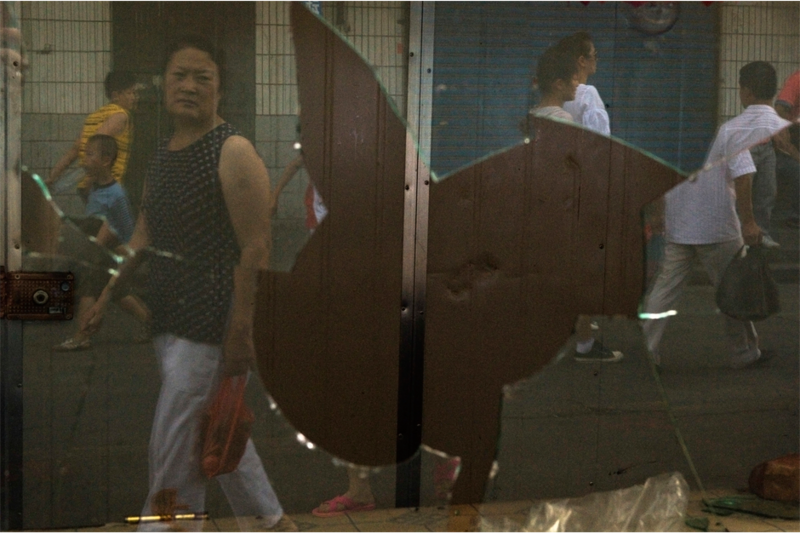 Reflections of passers-by form a fractured view of city life in Urumqi in the shattered window of a small store vandalized during the 2009 riots. 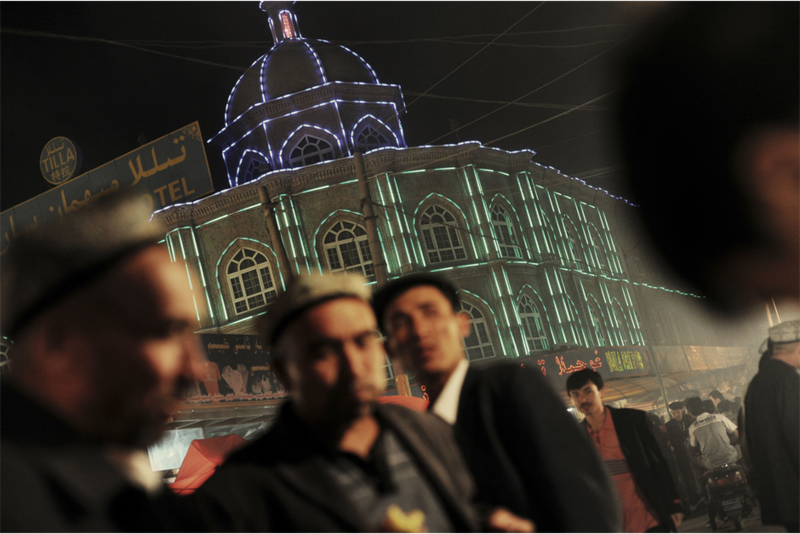 Uighurs break their Ramadan fast in Kashgar’s Old City two days before Eid festival, September 2010. Han migrant workers from Henan dance in the grassland of Tashgurkan at the end of the day in the summer of 2013. Massive investment in the development of Xinjiang has resulted in an influx of Han workers, but, many locals say, has not benefited the local population. 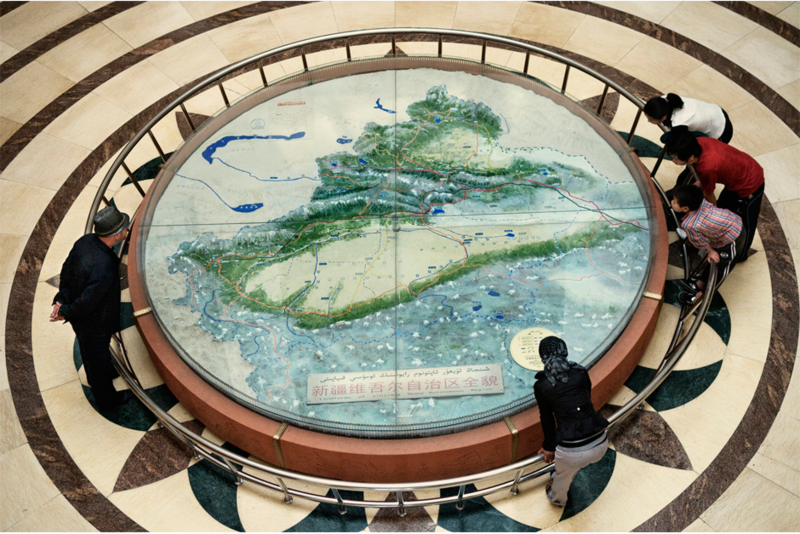 Han and Uighur visitors to the Xinjiang Uyghur Autonomous Region Museum look at a map of Xinjiang, in 2008. 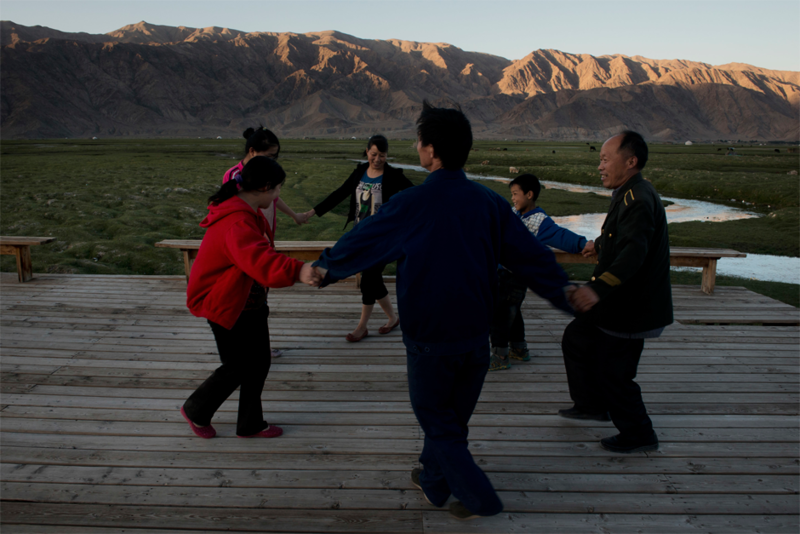 The Western Chinese province is home to close to a dozen ethnic groups. Combined, the Uighur and Han populations account for more than 80% of the total population, though the Uighur portion of the population shrinks as more Han migrants flood the province. My first trip to Xinjiang was in 1995; it was also my first trip to China. The UN’s World Conference on Women was taking place in Beijing and I could only manage to secure a visa for China on the condition that I would not go to Beijing (the authorities were getting nervous over the mass influx of foreigners in the capital). Since I couldn’t go to Beijing I decided to head west instead, with no clue about what to expect and little knowledge of the region. One of the most significant moments from that trip was the celebration of the 40th anniversary of Xinjiang as an “Autonomous Region” in Urumqi. I managed to sneak into the stadium to attend the commemoration. It was a mix of speeches and choreography, with thousands of kids waving banners—not unlike the North Korean mass games. I was sitting at the edge of the stadium and I could see dozens of kids outside holding hydrogen balloons waiting for their turn to enter the stadium. Suddenly, one balloon burst and all the other balloons caught fire with it, sending a huge flame up into the air behind me. A soldier stood up and prevented me from looking at what was going on. I could hear shouts and cries and minutes later the sirens of ambulances. Meanwhile, the speech continued as if nothing had happened. More choreography, more speeches, more applause. 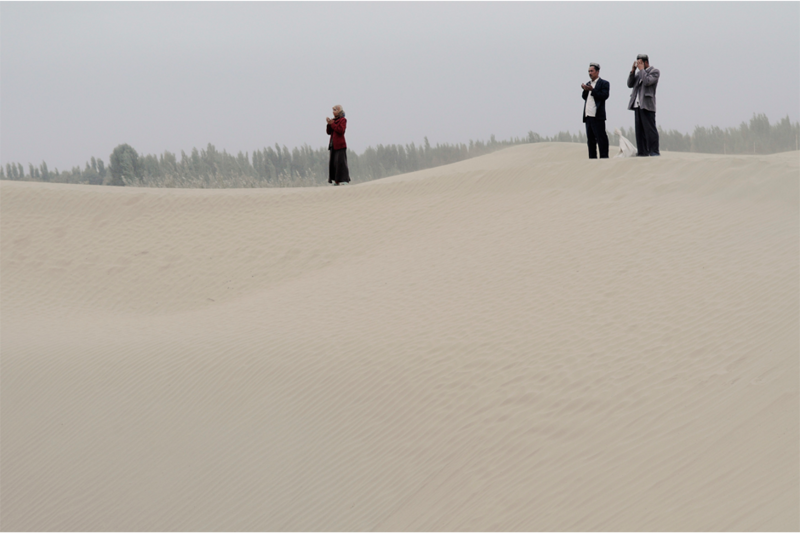 When you travel in Xinjiang, you see two communities living side-by-side but rarely interacting. Relations between Uighurs and Han Chinese have soured to the point where little dialogue seems possible. The 2009 Urumqi riots, in which a Uighur mob went on a killing spree that ultimately resulted in at least 194, mainly Han, deaths, was a turning point. Beijng’s “strike hard” policy in the aftermath of the riots, which continues to this day, has only created more resentment, hatred, and misunderstanding. 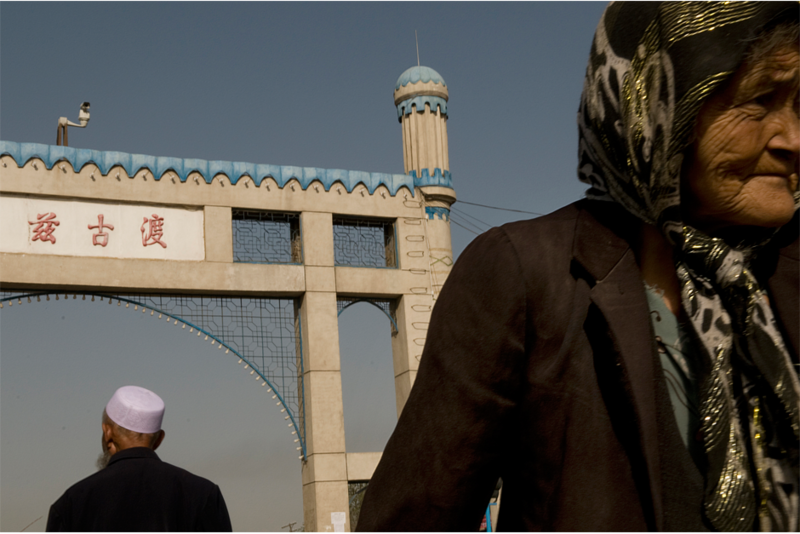 On top of economic alienation, Uighurs feel culturally threatened. The shutdown of Uighur language schools and websites and the new rules curtailing the practice of Islam have only reinforced the sense of a Uighur identity, which wasn’t as strong a few decades ago. Twenty years ago, there weren’t many women wearing the jilbab in Kashgar, or men wearing beards. Religious repression has only increased the appeal of a stricter form of Islam. Beijing’s encouragement of immigration by Han Chinese to Xinjiang hasn’t helped the relations between the two communities. I remember chatting with a Han Chinese whose family had lived for generations in Xinjiang. He spoke Uighur and worked with Uighurs. He had some resentment towards these new Han immigrants himself. He told me they had little respect or understanding for local people. Four years ago in Shihezi, a 60-year-old pioneer town built by soldiers sent by Mao to develop the new frontier, I saw Hans and Uighurs dancing side by side on the town main square. The first waves of Han immigration into Xinjiang didn’t necessarily lead to the segregation we witness now. For China, letting go of Xinjiang is simply unthinkable. It is part of the motherland, certainly not a colony as we might label it. Xinjiang is rich with badly needed natural resources (especially oil and gas) and of key importance from a geostrategic point of view. It shares borders with eight neighboring countries with which China has fast growing economic ties. Through Xinjiang runs the New Silk Road that leads all the way to Europe. China has even expanded its territorial footprint. Three years ago, Tajikistan ceded 386 square miles of its territory. One of the most recent and dramatic changes in Xingjiang is the ubiquitous presence of armed police everywhere. Dozens of surveillance cameras are at every corner. You have the feeling of a region under siege, a police state. Among the Uighur, fear predominates many people’s day to day actions and it is pretty widespread. People don’t talk as freely as they used to or they simply refuse to talk. Working as a journalist is also more difficult with plainclothes policemen following your every move.